I didn't hear much about last weekend's Taste of India, held at the Southbank so it was purely by chance that I stumbled across it on my way to The Hayward Gallery. I spent much of my time wandering around an exhibition, distracted by thoughts of curry. There were roughly around 20 stalls all wafting with delicious smells and it was pretty obvious what lunch was going to be. A few were bizarre, offering not only curry but paella and one stall even had a warming tray full of penne to serve alongside their curries. We swerved that one. After circumnavigating the market, we decided on sharing a few small dishes to reduce the opportunity of missing out on the good stuff. We immediately ruled out a couple of stalls manned by what looked like gap yah students who, like, totally discovered India on their travels yeah? and instead headed for the most interesting. A lamb nihari with roomali roti was picked purely because that stall had a heated dome which the chef rolled the rotis out, flipped and then cooked on to order, to ensure you had fresh bread to scoop up your curry with. The lamb was tender and in a thin gravy which was well spiced with cardamom. For £3.50, this was decent and the star really was the delicate, pliable roti. I wish I'd had more room to try the dosas they were making fresh on their hot plate. Horn OK Please had the biggest line, and they were selling dishes I'd not seen before. Billed as Indian street snacks, bowls of vegetables and sauces were out, and they meticulously filled hollowed out puffs (which I later found out were pani puri) with mashed potato and chutneys. 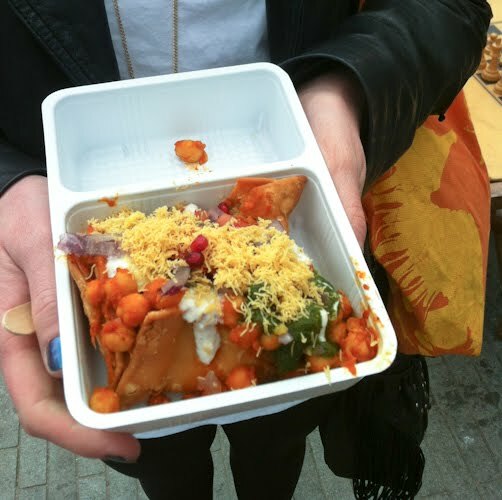 We opted instead for a samosa chaat; a huge samosa was split a little and topped with chickpea curry, mint and coriander chutney, a little yoghurt and red onion. A further sprinkle of (I think) fried chickpea flour strands (sev) and a few pomegranate seeds finished this, and for £3 we headed off to devour it. The richness of the dense, deep fried samosa pastry was saved with the tangy, spicy mint and coriander chutney. The Sev on top gave good crunch, while the chickpeas were creamy and slightly sweet. I totally loved this - so much so that I went back to try their Bhel Puri; a paper cone is filled with puff rice, crushed pani puri, that sev again and more chutneys and herbs. My friend went to Moti Mahal's stall to get a lamb wrap; this was abandoned in favour of my cone. Abandoning meat for a vegetarian snack if almost unheard of, so that's a testament to how great it was. They can be found at The Stock Mkt (Bermondset Square SE1 3UN), Friday 27th April 5pm - 10pm and at The Hiff in Henley on Thames. See their website for more details. Wikipedia has an excellent article on 'horn ok please', in case you were wondering what it meant. 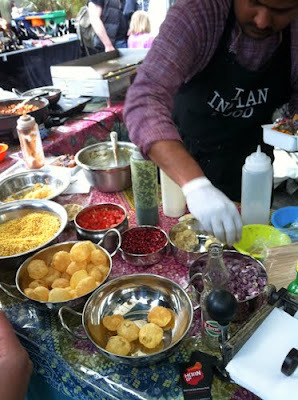 I love Pani Puri! There is also cold tamarind water in the puri too, you put the whole thing in your mouth and it kind of explodes in there when you crunch, really refreshing when it is a hot day. Looks pretty ace! I was a bit put off because the email I was sent about it referred to dosas as North West Indian when they're from the South. 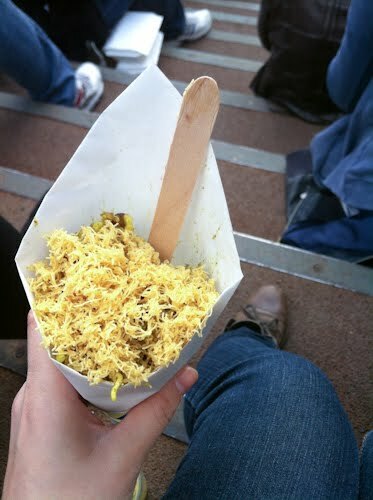 Anyway, I think I've blathered on about my love of Indian street food before. Bhel puri and pani puri are definitely some of my favourites. Missed Taste of India, so I'll make a beeline for their stall at The StockMkt - good find! Oh my goodness that looks so good. I think the lamb would be my favorite. I love bhel puri, what a shame this wasn't advertised much, I didn't hear about it either, but would have tried to go! Oh well, maybe next time! Ah, so that's what Horn OK Please means! Gutted I didn't try their chaats the previous weekend. Tried to go there yesterday but the heavens opened and suddenly street food didn't seem so appealing. I missed it ): urgh. I love indian food I would have been in heaven there. urgh. Deepa - ah ha! I wondered what that watery substance they were squirting into it was. Now I'm totally gutted I didn't try the,. Sharmila - from the PR people? I suppose that is a bit silly! It was ace though. Have you found Indian street food elsewhere? Katy - yes, please do - try the pani puri, as I'm now gutted I didn't! Kate - It was great. Lamb was actually my least favourite of all the dishes, but by no means bad. Kavey - Yes, I didn't hear much about it but the market was packed, so people must've heard about it from somewhere. Su-Lin - ah, I made it home just in time to miss the showers; it was glorious sunshine when I was there. Shu-Han - No matter, try and catch them at another of their markets? And then do a splurge at Tayyabs. Damn, totally missed that this was going on - not that I was in London on the weekend anyway, but still. The Bhell Puri looks ace as does the samosa. Love the sound of that flavour-texture combo. I suspect anywhere that goes to the effort of making their roti breads fresh is going to ut a bit of thought into the rest of their cooking. A good sign to follow (it's what bought me to Dehli Grill). Sounds like yet another reason to get down to Bermondsey (so much good food there at the moment) so I don't miss it again. When I was in India a year ago the horm beeping was crazy. It's definitely true that a lot of trucks have 'Horn Please' on the back of them. The wedding I went to had lots of street stall snacks which were awesome. It looks like gol gapa in the first photo? 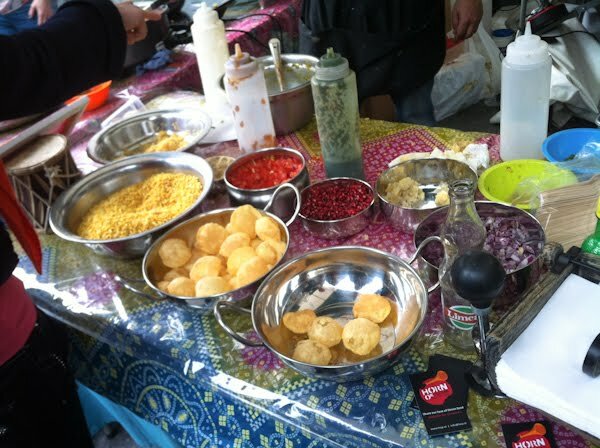 Tried the pani puri and the dosa at The StockMkt - both excellent. Forget all the poncey new age (and probably unauthentic) rubbish. Get yourself down to Diwana bhel puri house. Drummond street. Euston. A little bit of REAL Indian. Anon - New Age? Poncy? I don't understand where that came from, especially since you've probably not visited given that you said 'probably inauthentic'. But anyway, thanks for the tip.